Ticket to Ride has been a gateway game for so many of our friends and it’s easy to see why. The game is accessible, simple to teach and challenges you every time you play. 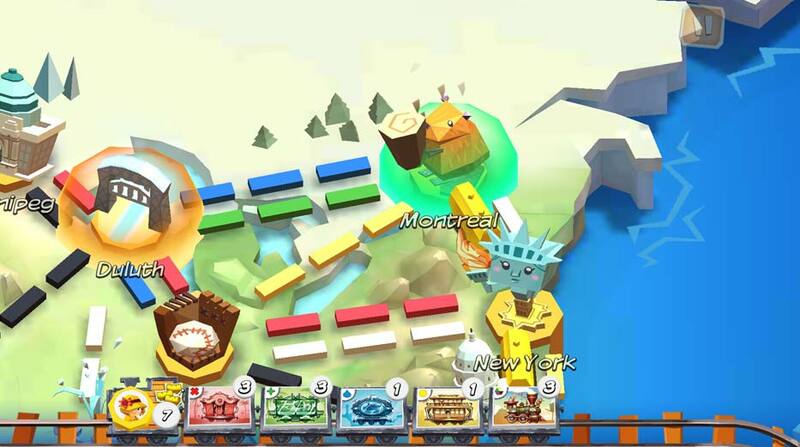 The new First Journey app from Asmodee Digital puts this experience in a bite sized form that is perfect for younger gamers. 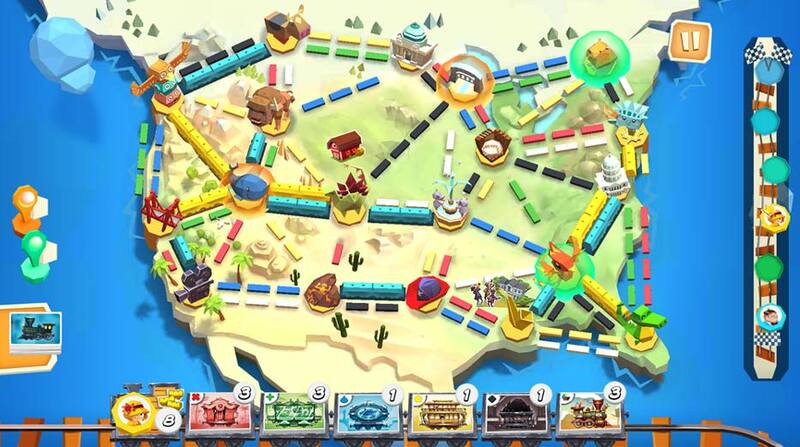 Ticket to Ride: First Journey simplifies this classic game and presents it beautifully on your phone or tablet. Up to 4 players can play by passing around the device or you can play against the computer opponent which has 3 difficulty settings. The game is a digital adaptation from the First Journey edition of the board game that hit store shelves in 2016. The app, like the original board game, caters to a younger crowd with simplified route cards, basic mechanics and less locations on the board. The app gives each player 2 route cards and clearly highlights their locations on the map when the player takes their turn. Your collection of train cards show up at the bottom of the screen, sliding in with a really cute train animation. Any Ticket to Ride fan will see that alot of the basics are included in this kid friendly app. Days of Wonder and Asmodee Digital did a great job of helping young gamers ease into these mechanics without overwhelming the player. The goal in Ticket to Ride: First Journey is to be the first player with 6 completed routes. You’ll see the score tracker on the right side of the screen with the player icons climbing toward the goal as they finish routes. This app does so many things well and there is a polish that I’ve come to expect from Asmodee Digital games. I absolutely love the animations that play for each of the cities on the map as you complete routes. The beaver chewing on the log in Montreal has to be my favorite! The colors are vibrant and fun. The sounds during the game are great and really set the mood. The game was clearly built with kids at the heart of the experience. Adults need to know this because they’re not the target audience. I really like how this app encourages to come back to the game to earn new in-game items. 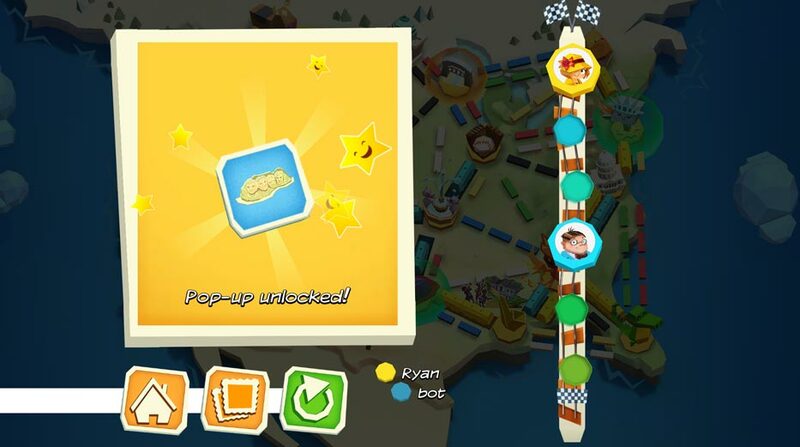 There are 34 “pop-up prizes” that players earn as they play. I only wish these awards could be clicked on to be seen in greater detail on the screen. The game plays very well on mobile phones with large screens (played on a Samsung Galaxy S5), but I’m positive that this experience would be even better on a tablet. There is so much great detail on the map that can be lost on smaller devices. If you’re looking for a great way to ease young kids into modern board gaming, Ticket to Ride: First Journey is a fantastic experience. I would say the age range for this game would be perfect for ages 3 to 6 or 7 years old. This will obviously depend on how quickly they graduate to the Ticket to Ride that we all know and love. You can purchase the Ticket to Ride: First Journey app today on for your Android or Apple device. AI isn’t punishing and good for kids.